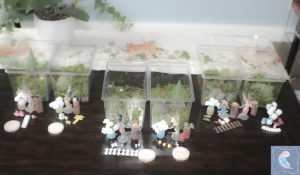 The primary activity I planned for Misha’s fairy garden party was for each child to design their very own fairy garden. They would take these home as their party favors. 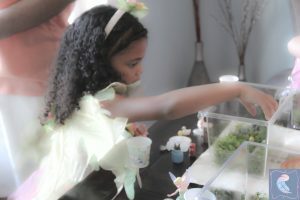 I bought small pet carriers from Walmart for each child to create their garden terrarium. They were $6 in store; we labeled the tops of each carrier with a sticky file label with the children’s name on them. *Budget alternative: but a small bowl or plastic garden pan from the dollar store or garden center. The last Disney Fairy Movie came out in 2015, so it was a bit of a challenge to find fairy figurines. Lucked out with these fairy figurines from Walmart.com, I attempted to order less expensive fairies from Amazon but when they arrived the quality was lacking. The wings were not attached, and some came broken, others broke upon assembly. I sent those fairies back to Amazon and got a refund. 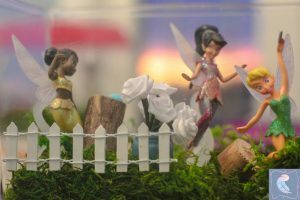 *Budget alternative: While the Disney Fairies gave us the diversity and quality we wanted in our main attraction, you could order none brand name fairy figurines off Etsy or from the craft store. 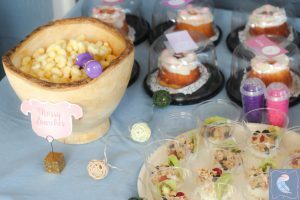 The moss, trees and wood stumps were also left over from Camp Giana, we reused them for this party. 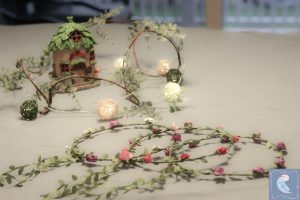 Here is a complete list of supplies you can get at your local craft stores such as Joann Fabrics, Hobby Lobby or Michaels for your garden assembly, I have also provided some Amazon affiliate links. I kept my eye out for little accents over the last month and lucked out and caught a couple more items on sale to add to the party decor. Found fun strings of battery operated lights and a faux string of tree branches with leafs from the dollar section of target. The Bloom Room items were all 50% off when I went to Joann Fabrics, so I got this cute welcome Lilly Garden House and the clay pots from there. I separated the wire stems into groups of 6 and twisted and bent them to fill the pots with flower bouquets. The Disney Fairy decorations were also being closed out at Party City; I bought a tablecloth and six-foot wall scene setter at 50% off. As well as streamers which I never hung, anyone who wants to recreate this theme, make sure you message me to grab those! You cannot have a fairy party without fairy accessories. 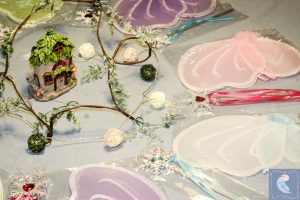 Amazon had plenty of options for fairy party wing packs and garden headpieces from Amazon. The wands I ordered were more customized from Etsy. 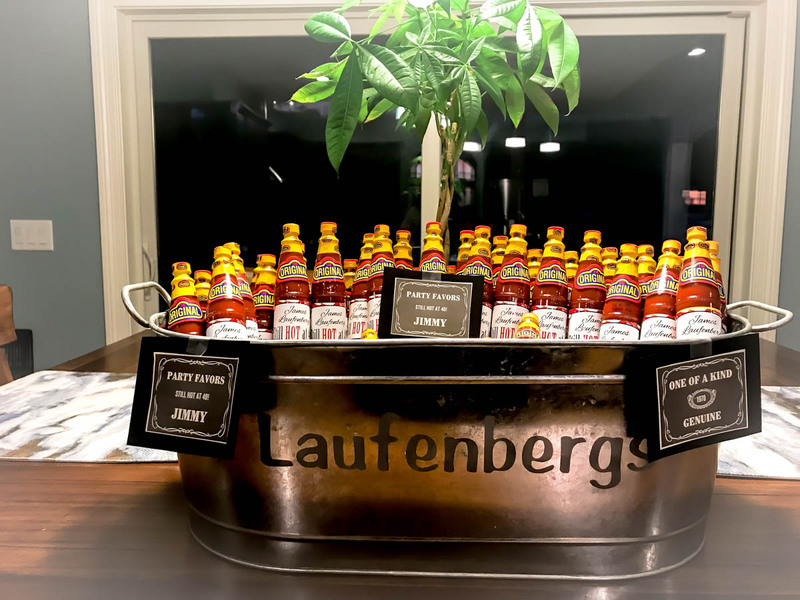 These doubled as both party favors and decor. I decided to hire Tinkerbell to come to the party. Misha had been terrified of characters in the past but had declared she had conquered her fear. Why not give that a test? I found Princess My Party and for $100 we had a little whimsical surprise planned. I paid Fifty percent at booking, and the fairy was contracted to arrive at 3:30 and would give us a 10-minute heads up call. The fairy garden activity went faster than I anticipated, nonetheless, we proceeded to the next station. 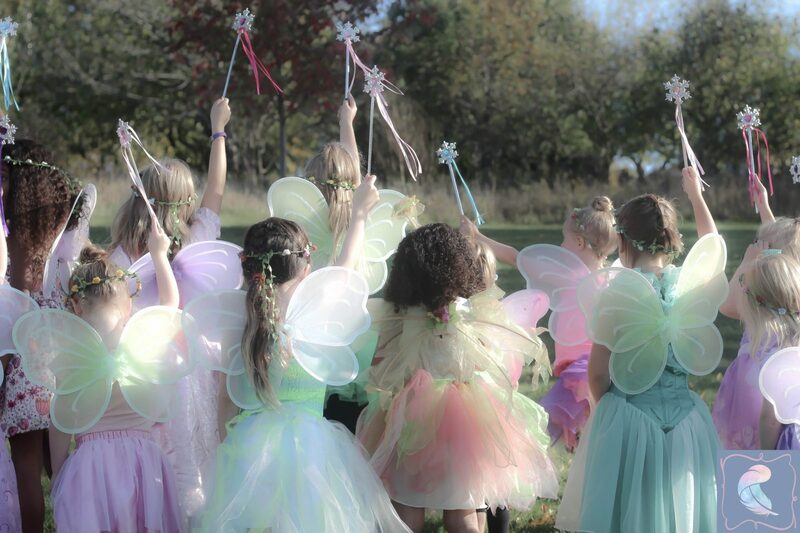 After I praised the ladies for their fairy garden assembly and announced that they had earned their wings. The birthday girl handed out wands, wings and garden crowns. After she completed the distribution of fairy accessories, we went outside to take a group picture or 12. 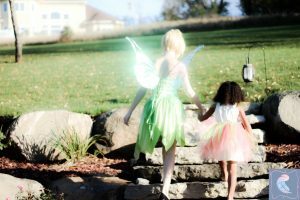 When the little fairies turn their backs to me, my sister released Tinker bell to approach the crowd from around the side of the house. The kids were delighted and surprised by the surprise visitor. When Tinker bell introduced herself to the kids, I was distracted by the fact that she was touting a generic red canvas bag with her supplies. It just didn’t feel fairy-like. They should invest in a Disney sack or sparkly fairy bag. If I had been recording her entrance and the surprise, this accessory would not work with the magical spirit of the moment. 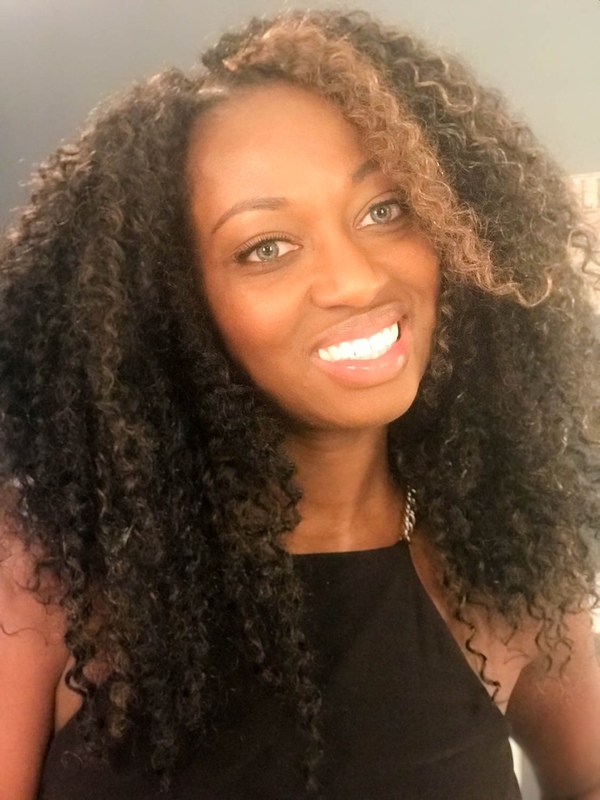 She proceeded to do makeovers on the girls out on the patio daybed which was super cute, it was 75 degrees and the rock wall made the perfect backdrop. This gave me a few moments to breathe, take a sip of my mimosa and coordinate the food serving. The girls who went with the blue/green toned eyeshadows likely needed their first sample of mom’s eye makeup remover that night, your welcome! Next, I suggested she read them a story, as they snacked on their fairy food. They quickly lost interest, and some requested to return to the playroom for free play. Mind you, I only hired her for an hour. 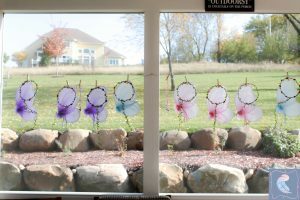 The moms collectively agreed her energy could have been higher to keep the kids engaged. #fairyproblems. 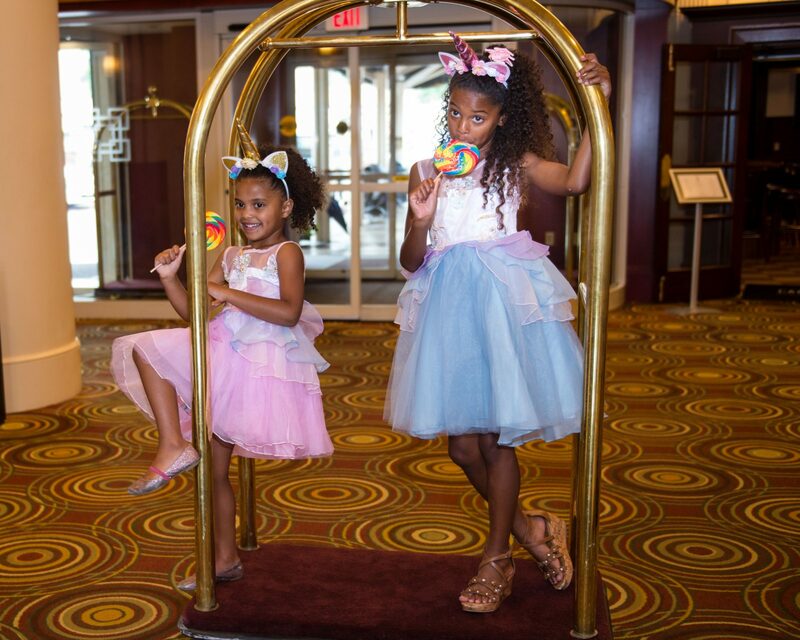 While they may have been antsy to explore and play, a fairy visit should be especially captivating. Tinker bell gave out fairy dust necklaces, My mom and I made for the party. 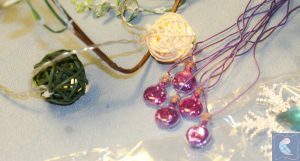 We purchased small cork top glass bottles and filled them with pink and purple glitter and strung them with pink and purple string. Last year we had a camping theme party for Giana, and we got these wooden bowls from Marshalls and large woodcuts for trays. I recycled them for this party’s decor. Here are some similar bowls from Amazon. 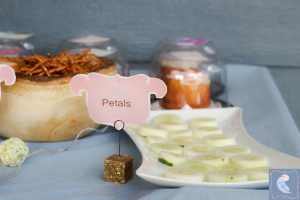 Since I was able to utilize the leftover supplies from a previous party I was able to layer in more activities and favors than if I was ordering all items from scratch. 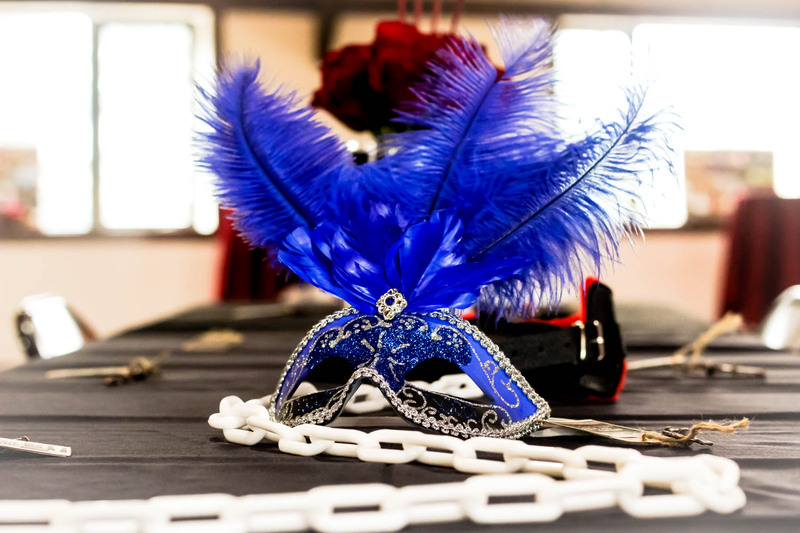 Consider the timing of movies when planning your theme, if you time it right the theme is still relevant to the attendees. However even if the theme is fading, you may be able to catch some deals in closeout sales. 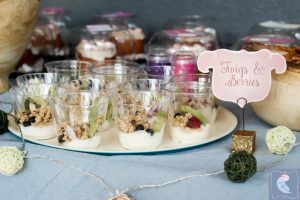 For more party planning ideas read on.